Season 2 manages to improve on everything from Season 1. Netflix released their entire next instalment of original series A Series of Unfortunate Events just in time for an Easter binge-watch. It was with apprehension that I sat down to watch Season 2 as I recall having a mixed reaction to the previous series. However, this was a chance for the show to break away from continual comparison to the 2004 film as Series 2 two focused on books 5-10 where the film only covered 1-3. I believe this was the saving of the show as it allowed it to come into its own and imprint a unique stamp upon the source material. The excitement of finally seeing a vast portion of Lemony Snicket’s books brought to life fuelled one to look for the positives of the show, rather than critiquing it against other adaptations. The Baudelaire children continue their quest to find guardians who can not only offer them answers about the mysterious VFD organisation their parents appear to have belonged to, but also protect them against the relentless pursuit of Count Olaf. Yet, as the title suggests and readers of the books will know, this is a quest that is unfortunate, unfavourable and unsuccessful. The series picks up immediately where the previous one ended, quite literally, as the children are sat on the same bench outside the Vice Principal’s office at Prufrock Prep School. True to the self-awareness that brought comedic success to Series 1, Klaus (Louis Hynes) opens with a comment that they have been waiting so long, Sunny (Presley Smith) is starting to look less like a baby and more like a toddler. It is true that Smith looks remarkably older this series and given the year of production time, she really has changed from a baby into a toddler. Whilst this means that the series must deviate from the books, which used the artistic licence of literature to keep Sunny as a baby throughout, this is no bad thing. The CGI used to control the facial expressions of Smith in Series 1 were quite frankly terrifying and made her look like an alien rather than cute baby. While a little work is still done to control her mouth in Season 2, it is considerably less utilised, and it allows Smith’s cuteness to shine through. 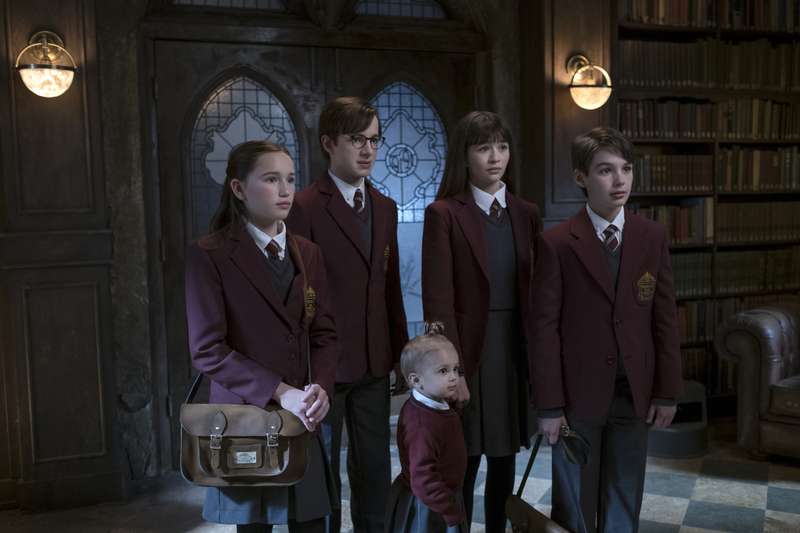 Furthermore, now that she can crawl/ walk when holding Violet (Malina Weissman) and Klaus’ hands the Baudelaires seem more like three siblings in their own right, rather than two siblings with a baby that one of them must always carry. The year gap between the series has also effected Hyes and Weissman. Whilst the physical differences are less noticeable than their TV sister, it is noticeable in their performance. Hyes seems to really excel in Season 2 and his assumption of the Klaus Baudelaire persona is much more smooth and believable than the forced performance he gave throughout Season 1. A critique I had last year was that a good script was wasted on the child actors who couldn’t deliver the lines with the dry sarcasm they needed. I revoke this statement in the case of Klaus who, for me, was one of the strongest characters of the series. It is with regret that I cannot say the same about Weissman’s portrayal of Violet which continues to feel 2D and wooden, this is even more noticeable now that her co-stars are shining in their respective roles. However, this does not mean you should take Count Olaf’s (Neil Patrick Harris) advice in the theme tune and look away. For if you did, you would miss another great contribution from seasoned actor Harris and narrator Lemony Snicket (Patrick Warburton). It was nice to see Harris’ real theatrical abilities better utilised this series as he was given three musical numbers; a great coupling of Olaf’s self-presumed theatrical talents and Harris’ genuine musical capabilities. Whilst I still believe Warburton to be an excellent casting choice, I found his moments of narration to be overly consuming of screen time. The narrative contributions of the Snicket books felt much more smoothly blended into the story than the harsh cuts between storyline and Warburton’s interjections. The original material places a lot of red herrings, literary and literal, in the series before revealing all in bulk towards the end of the books. I appreciated the TV show’s slight deviation from this which rewarded the audience with satisfying revelations, nicely timed throughout the whole series. Eagle eyed viewers and readers of the books would have even spotted the few Easter eggs (how seasonally appropriate) placed in before the reveals; this includes (SPOILER) the photo of the fireman on the wall of the saloon in the town of VFD, before the audience official learnt what the organisation VFD meant. Despite the satisfying answers given in Season 2, more mysteries remain as to the VFD, the Quagmires, the sugar bowl and the apparent survivor of the Baudelaire fire. The ending was, in Snicket’s beautifully literal way, a cliff-hanger. Violet and Klaus have been separated from Sunny who is in the hands of Count Olaf and their horse cart is moments away from falling off a mountain. With the next instalment pitched to be the concluding series, audiences must eagerly wait another year to learn the Baudelaire’s ultimate fate. I for one cannot wait to see if this series of unfortunate events, may find its happy ever after. A Series of Unfortunate Events is now available to watch on Netflix.